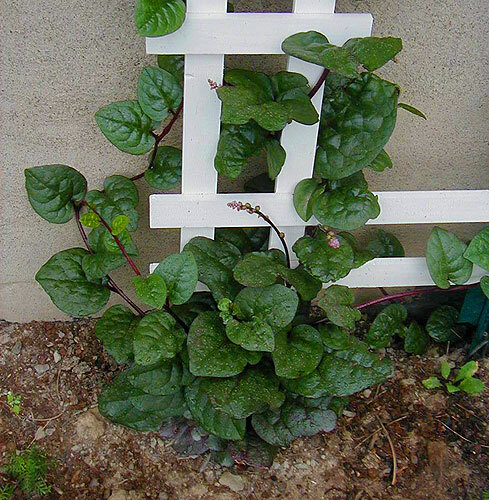 The leaves from this heat-loving vine have a mild flavor and are used like spinach in salads and cooking. Extremely frost-sensitive. It creeps when temperatures are cool, but leaps when the mercury hits 90 F.
Part shade increases leaf size, but prefers hot weather and full sun. Grows well in a wide range of soils, but prefers moist, fertile soils, high in organic matter, pH 6.5 to 6.8. Requires consistent moisture to keep from flowering, which causes leaves to turn bitter. Grown as an annual, but is perennial in frost-free areas. In most of New York, you must start plants inside and transplant after danger of frost has passed. Requires trellising. not native to North America - East Asia origins. Days to emergence: 14 to 21 - Scarify seed to hasten germination. In Zone 7 and warmer, direct seed 2 to 3 weeks after last frost date. In colder areas or to get an earlier crop, start seeds inside about 6 weeks before last frost. Scarify seed (use a file, sharp knife or sandpaper to carefully cut through the tough seed coat) to speed germination, which may take 3 weeks or more. Wait until soil has warmed and all danger of frost has passed before transplanting -- at least 2 to 3 weeks after last frost date. Space transplants about 12 inches apart. Well-adapted to high temperatures, even into the 90s F. But growth is disappointing when temperatures stay below 80 F. Requires consistent moisture to keep from flowering, which causes bitterness in leaves. Requires trellis or other support for twining vine. Can follow peas up the same trellis. 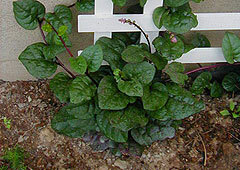 Browse Malabar spinach varieties at our Vegetable Varieties for Gardeners website. Seed companies usually only list the species. Occasionally, you can find the variety ‘Rubra,’ which has purplish stems. It is sometimes listed as a separate species, Basella rubra.